Learn how to successfully manage wedding stress with hypnosis! give you the power you need to finally manage wedding stress. Even the most exciting and memorable days can be filled with seemingly unmanageable stress. Such is the case in planning a wedding. 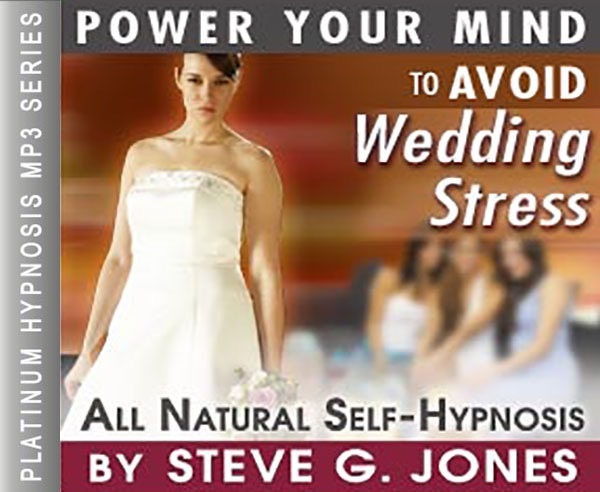 Using this Wedding Stress Hypnosis MP3 is a way to relieve stress and organize your self will help reduce the pre-wedding tension. With hypnosis, planning a wedding will be a more enjoyable experience. You will feel more in control and organized, which will in turn reduce stress levels. Steve G. Jones is a clinical hypnotherapist who developed a self hypnosis program, Wedding Stress Hypnosis MP3 session. Begin it at least 3 weeks before delving into the heart of your wedding plans. The program used over 21 consecutive nights will make each day of wedding planning something to celebrate. A wedding can be an extremely stressful event. There is the anticipation of the marriage on the part of the bride and the groom. There are also financial scheduling and time considerations. It is easy to get caught up in the stress of an upcoming wedding. However, with the help of hypnotherapy the marriage can be a beautiful even as it was intended to be. Both of the bride and groom can relax and focus on the beautiful matrimony which is about to take place. Through advanced techniques developed by Steve G. Jones, clinical hypnotherapist, the wedding becomes a very peaceful and relaxing event. Steve simply guides you through imagining the wedding day and imagining it going very smoothly. By doing this process known as pre-framing (an NLP technique) you will find stress relief to be an illie process. You will imagine all the events leading up to that beautiful day and the beautiful day itself flowing smoothly with no problems. Of course, everyone understands that there will be some problems somewhere along the way. This is normal, however, by imagining a stress free, problem free wedding process and actual wedding, you will find that when those inevitable challenges do arise, you are able to deal with them quickly, calmly, and easily because you hold the vision in your mind, of a beautiful wedding. So, you naturally gravitate towards creating this vision in reality. Dr. Steve G. Jones, Ed.D., Clinical Hypnotherapist, charges $1,500 for a custom hypnosis download and $25,000 for a one-hour private hypnotherapy session at his office. but you can get all the benefits for this low price. Simply listen to the Wedding Stress Hypnosis MP3 download every night as you go to bed for three weeks and feel the changes happening in your life. You will feel more empowered, more in touch with your true self, and you will truly know that your goals are within your reach. And as you continue to relax you realize just how relaxed you are in every situation. You are so relaxed thinking about the wedding, so very relaxed. And imagine now that it is the wedding day and you are so amazingly relaxed and calm. And as you see yourself there on that wonderful day, you see yourself smiling, so very, very at ease. And as you look back now at all the events that led up to that day, you see that they happened easily, they flowed because you were calm. You were very relaxed. You were very peaceful. So see yourself there on that special, beautiful day, smiling, realizing that everything is just fine. Everything just fell into place easily and effortlessly, that’s right. And as you now slowly imagine yourself coming back to the present, back to the present time, you now see a calm, relaxed path to that special wedding day. You realize that all the events will take place easily and that you will be relaxed every step of the way. Relaxed and at ease, it’s as if pressure just bounces off and away from you, bounces off and away. It’s as if you have a protective shield around you, a shield that protects you from outside stress and any stress that comes from inside just drains away. Feel it draining through the bottom of your feet now, that’s right. Feel any inside stress draining from your body from the bottom of your feet, leaving you relaxed and at ease. Day by day you become more relaxed as you approach that very peaceful, wonderful, calm day. So relax now and realize that everything is just fine. A wedding is one of the most important times in your life. Often times, people grow up imagining their dream wedding, so when it actually becomes time to plan a wedding the stress can build up. You want your wedding day to go perfectly. You want to be calm and relaxed on your wedding day so that you are looking and feeling your best! This powerful hypnotherapy program will help you prepare for your big day! Your wedding does not have to be a big stressful event and it won’t be when you listen to this self-hypnosis session. You will be able to imagine yourself looking amazing and feeling fantastic as you marry your partner on your wedding day. Preparing yourself to be relaxed for the big day will make all the difference! We suggest you listen to this Wedding Stress Hypnosis MP3 recording during the 3 weeks before your wedding. You will want to use this hypnotherapy session at night before you go to bed. Powerful suggestions will be targeting your subconscious mind so that you can manage your wedding stress before the wedding and during your big day! You can be at easy and relaxed while planning your wedding with this hypnosis recording!